It feels like a long time has passed since our last posting. The growing season has wrapped up in Riley Park, and it seems that our work on the produce library is coming to a close. 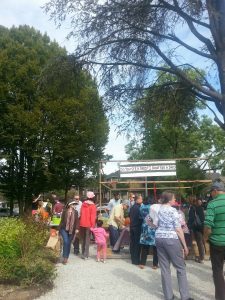 Since the last blog post, we have drafted a survey for the Little Mountain Neighbourhood House, which will be used to gather information on people’s opinions of the events at Riley Park and ideas on how the garden could be improved. The produce library is completely built now, but we have realized that we will not be able to reach our goal of animating it with the amount of time we have left in our course. This realization has been a moment of significance for us. We have developed some ideas about the animation, but we have not had the opportunity to come together and implement the plan; doing so would require knowledge of what will happen in the garden over the next few months. For example, we would like to create laminated information cards that detail nutritional information of the food to be placed inside the produce library. However, we do not yet know who will be supplying the food, nor what kinds of foods will specifically be in there. We also wanted to note a few ways this food could be prepared. Once we created these laminated information cards, we wanted to place them inside a little wooden holder that could be attached to the produce library. This process would probably take us another couple of weeks. However, with the term coming to a close, we do not think this will be accomplished. The building of the produce library itself took up a lot of the term. Because the produce library is not fully animated, we will not be able to really see its effect on the community. We can only predict and talk about the expected outcome. This is not ideal, but much more work and research must be done before we can animate the library in a way that is effective and useful. 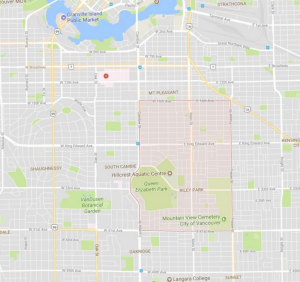 We do not want to do it hastily without fully spending the time to consult with people in the neighbourhood. What we learned during this project was that it takes much longer to get things done when trying to take into account many different ideas and potential directions. Even during the initial placement of the produce library, we encountered uncertainty about where exactly it should be situated. After digging the holes for the structure – nearly two feet deep through rocky earth and clay – we found out that the community members had not reached a consensus on its location. This meant that we took a lot longer to do things than predicted, which was an important learning experience. As well, we will not be able to distribute the surveys ourselves and see the results. We hope the information in the surveys would give us more insight about how to animate the library appropriately. Although there is still a lot more to do with our produce library, we believe this experience was helpful in meeting our learning objectives. For example, we had to deeply think between the connections of food, health and the environment on a local level while at Riley Park, even though we did not meet all our project goals. From here, we hope to outline a plan for future directions, which we hope will be useful for anyone who will be continuing the project. We will provide as much information as possible, and perhaps convey some challenges we faced. Hopefully, some results from the survey we produced will be released, and will serve to help the next group approach the project. 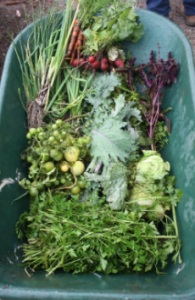 There is uncertainty with the future of the produce library; we did not get the city’s approval on the placement of the library, and so it may not be able to stay in the garden. Even so, our work on the project allowed us to learn a lot about working within the community and with others. Moving forward, we would also like to see a shift towards more of a capacity building mindset within the group – a perspective that would have been useful in the beginning of the term. A capacity building mindset would have allowed us to realize the importance of community knowledge and experts earlier. We did not meet our full potential in this project; however, upon reflection we have identified where there is room for improvement. We have assembled the produce library as of week six of our thirteen-week journey. 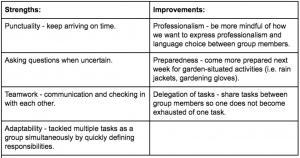 Reflecting on the completed work, has prompted us to formulate weekly objectives to prepare us for the weeks ahead. Set up meeting with our questionnaire contact, Tamara. Create a design for the produce library that will aim to improve food literacy. Attended the event, Riley Park Through the Ages, and helped set up tents and posters. Dug more holes for the relocation of the produce library. Secured the roof and shelves with nails and bolts. Established a contact for the questionnaires that will target two groups, those at the neighbourhood house who may be experiencing food insecurity and those at the farmer’s market who may consider donating to the produce library. Interviewed and surveyed members at the Riley Park Through the Ages event. Determined location and place for meeting with our questionnaire contact. Graph 1- Development of Emotions and Knowledge Week 1 to 13. We realized most of our group members believe that we have gained different kinds of knowledges and skills while working on our community based project. 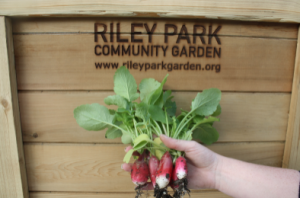 The experiences of working on the Riley Park project provided our group with a much deeper understanding about the association of food justice, food security and community. We all believed that we have also developed public speaking skills and communication skills since we had been arranging meeting, organizing events and giving out feedbacks frequently with our community partner and the volunteers from the Riley Park Garden in a professional way. 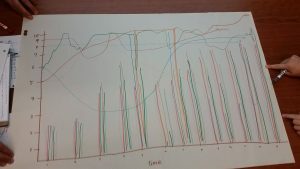 We tracked our emotions and amount of knowledge we gain over the weeks thus far and projected until the end of the term. The y-axis is represented in magnitude: 10 being excited and 0 being upset or very confused. The x-axis represents time, in weeks, which also is how we tracked our bar-graph of knowledge. From the emotion curves that we have created, it is obvious that each of our group members have different feelings, impressions and perspectives towards the same meeting or workshop. One common experience with diverse perspectives from our group is the first meeting with Joanne, our community partner. Some of our group members were feeling excited about the upcoming project while others were a little bit overwhelmed with our project’s objectives. Although we had different emotions during the past weeks, we all believe that as we near the end and see what we have accomplished we will all have good impressions of the project. One of the most unexpected learning experience for all of our group members was assembling the produce library and the manual labour involved. Many group members grew-up in urban settings, where we seldom have chances to physically assemble structures, therefore, it was quite challenging for most of us due to the lack of experience. 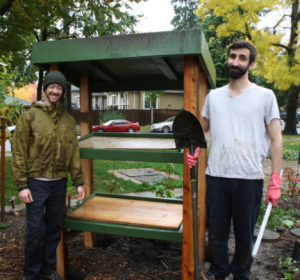 However, with the help of the volunteers from the Riley Park Garden who have architectural backgrounds and experiences, we successfully and efficiently assembled our produce library within an accumulation 3 hours. It is important to keep up the momentum of our project as it nears the end stages. First, by continuing the group attributions that have helped us get this far – communication skills which allows us to work together efficiently and productively. Since meeting with the Riley Park community leaders and volunteers almost weekly, we have no concerns regarding the communication between our group and the community members. To ensure the successful completion of our project, we will continue communicating as per usual with all members of the project. Secondly, we have been documenting our progress each week, and discovering areas in which we can improve, whether it be tardiness or just being prepared for the weather. Table 1- Internal Anonymous Feedback of Areas of Strength and Improvement. The documentation provides us with feedback that we can refer to and it also shows us how close we are to the completion of our community project. We have realized that it is no longer about learning from the completed project, but about learning along the way. As long as we keep up these strategies, we should have no issues ensuring the successful completion of our project. If food is a human right, which should be free of prejudice, then why are so many hungry? What’s going on with our food system? When we first arrived at Riley Park early on a Saturday morning, we were all surprised to see the number of people already there. Individual stalls were set up, with vendors selling a variety of foodstuffs, such as fresh local produce, artisanal bread, and gourmet honey. The area was so vibrant, and everyone seemed like they belonged in the community. To one side of the park, we spotted the Community Garden, still looking lush late into the growing season. In our first moments there, we felt a little out of place. We didn’t know the community or the dynamics of the garden, but thankfully our community partner, Joanne McKinnon, arrived to make introductions. When we met with Joanne previously, she had introduced the goals of the project. Our overall aim is to use available resources to strengthen relationships in the Little Mountain Riley Park community by promoting awareness of food security issues. In order to give this abstract goal some shape, Joanne had the idea of constructing a produce library–an outdoor wooden structure that will be able to house extra fruits and vegetables that can be taken from or donated to as people need– at the Community Garden as the centerpiece of our project. In addition to helping assemble it, we will be animating the produce library so that it is attractive, informative, and representative of the community’s needs. During the process, we will also try to come up with other strategies that will share information about food literacy and promote existing and future services effectively. After our introductions at the garden, we were able to see the resources available for the project. 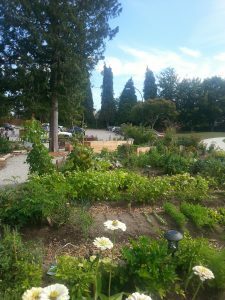 Some assets include the community garden fieldhouse, which is a small facility with storage space and a little kitchen, a garden space that hosts educational, food-related events, and the enthusiastic volunteers who meet at the garden every Saturday. We had ideas of how to approach our project, which is centered on increasing food literacy and security; however, we were not exactly sure how to get started. But where there is uncertainty, there is also opportunity: Sirolli said that no great business was started by one person (TED, 2012), so working with each other on a project is both appropriate and rewarding. As a group, we share a collective interest in working closely with the community, and though we each had our own motivations for choosing this project, one common reason was being able to foster a community at Riley Park. Between the six of us, our initiative, and the resources at hand, we assumed we had a powerful force for change. However, after our meeting with Joanne, we realized that our actions would only represent a small part of the change we sought to establish. Sirolli’s TED talk (2012) reminded us that it takes a group to successfully see change, not one single person. It didn’t occur to us at the time that our group of six was in many ways no more effective than an individual. To see some level of reform in our food system, there needs to be more active members engaging. This realization does not make us feel hopeless or insignificant. However, as a group of six, we know that by being resourceful and reaching out to our community, local change is possible. We will apply some concepts of Asset-Based Community Development (ABCD), specifically that “everyone has something to contribute” and that “meaningful engagement occurs through dialogue and active listening among community members” (Valley, 2017), which is evident by the relationships we have built with the volunteers and our openness in receiving their feedback. While in the community, we also hope to look at the produce library through a food justice lens. Everyone has the right to food, yet due to the current inequalities of the food system it is not being implemented. It’s important to think about social and political factors that influence an individual’s access to food. Complex issues of why people are hungry and why our food system is they way it is forces us to look at our history to understand our current situation. This interrelated issue of hunger concerns food justice. Food justice is the right to food, recognized in the Universal Declaration of Human Rights as a human right in 1948 (United Nations, n.d.). It is clear that our food system has failed those a part of our target population at Riley Park. Consequently, a hunger gap occurred. Initiatives such as our project are only temporary solutions that try to mask a larger systemic issue. Temporary solutions also extend to food banks, such as the UBC – AMS Food Bank where one of our group members, Alisha, is an article contributor on the Food Bank blog. On the blog, we aim to cater to our audience as much as possible. We share recipes that we believe require appropriate tools and nutrition information framed in understandable and non-scientific language. However, there demands to be more political involvements, funding and attention around these issues in order for people’s lives to change such as those in our Riley Park target population. Our produce library is a small, yet important step to contribute to closing the hunger gap locally. While we work on our project this term, we will continue to write about our goals, progress and outcomes.